It was probably a little too chilly for sketching from the car studio today: -10°C with an even colder wind chill meant that I had to turn on the car heater quite often to warm myself up and dry the washes on my paper. 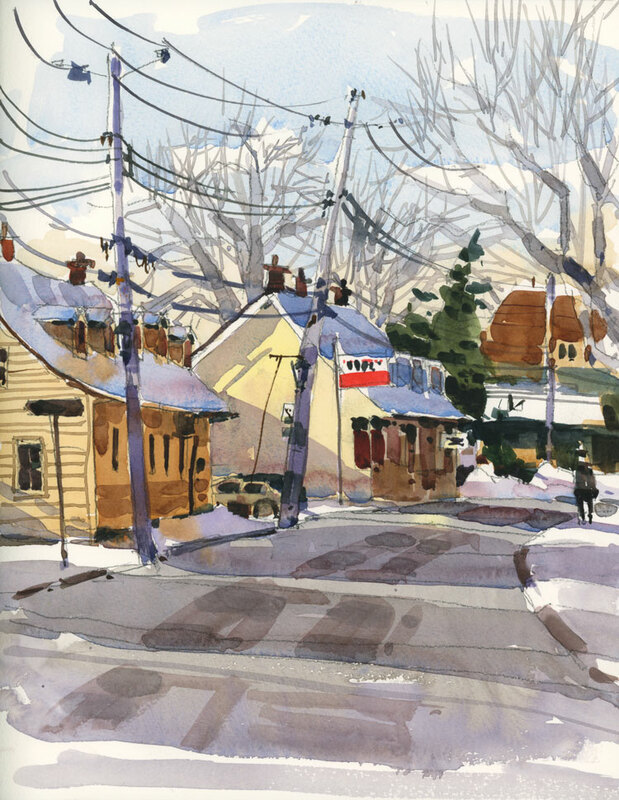 But… the light was wonderful on Lakeshore Road and since we haven’t had that many sunny days of late, I sketched away, even if it meant having frozen feet. The yellow wall on the side of the Canadiana-style building had a wonderful shadow on it and that made me forget the discomfort for a bit. I was back at school today, drawing in the cafeteria during a break. If you sit there for a while you notice two things — and this is not a new observation because I have mentioned this before— students leave their winters coats on indoors and they are always on their phones. 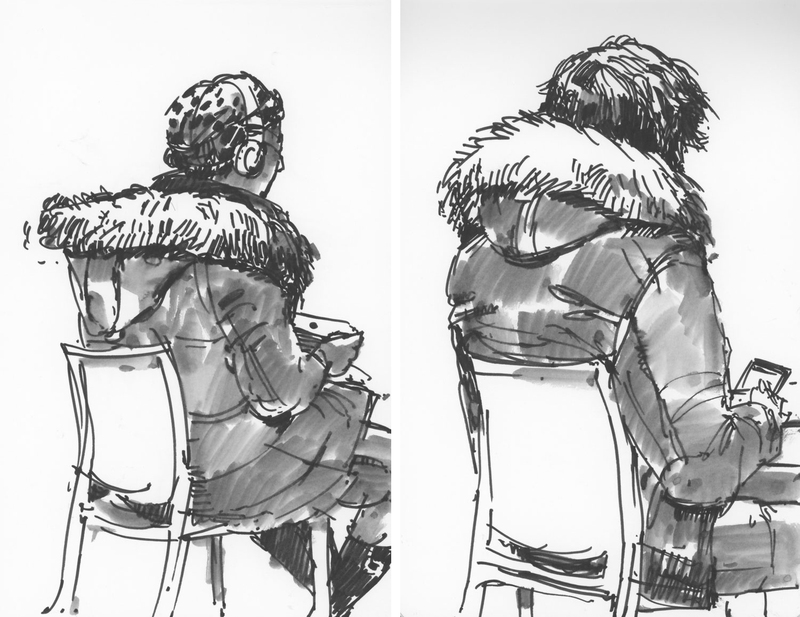 I drew the girl with the fur collar first and when she got up, she was replaced by an almost identical figure in a fur-collared jacket, also on his phone. I used a V-Sign Pen from Pilot for these drawings. It’s got a fatter nib than pens I usually use, but it’s great for quick drawings because the ink flows quickly, especially if you use smooth stock like this Stillman & Birn Zeta paper. It’s also really black! And a bonus for quick studies like this: it uses water-soluble ink so a quick once-over with a water brush will give you some good grey tones. I haven’t had time to answer comments from my last post yet, but I wanted to thank everyone who sent me a note. I was completely bowled over by all of the truly wonderful wishes you sent my way. I don’t know about you but sometimes it takes me several starts to get the result that I want. 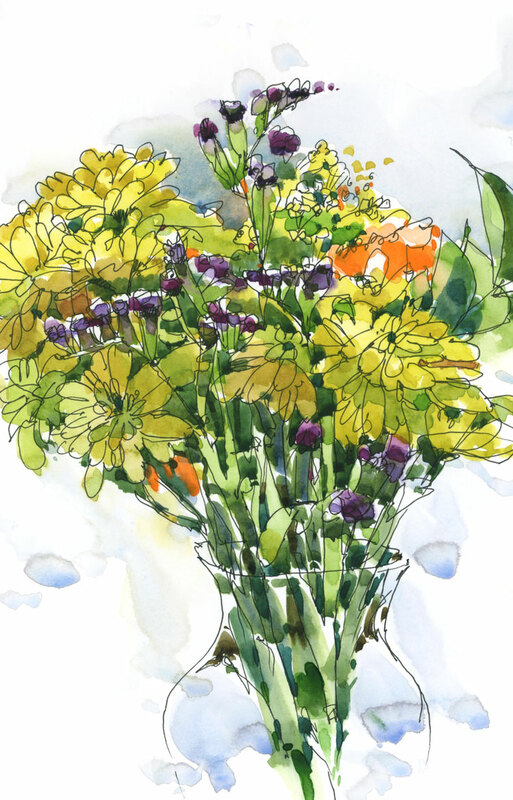 With florals my aim is to keep the watercolour loose and fresh, not overworked or nitpicky. Today’s first try — painted with a small round brush — looked like that, so I decided to give it another go. I grabbed a fresh sheet of paper and for my second attempt I picked up a big, flat 1 1/2″ brush. There’s no mistaking what the shapes will be with a brush that wide. You can’t work on details. And since flowers of the same colour seem to look better when you paint them all as one big mass, the big brush helped me get a better start. Thinking carefully about edges, I painted a big yellow shape and then did the same with the red, and from there it was easier to work in the details like the leaves and the stems (the flat brush is ideal for painting stems, btw!). Painted on Arches CP paper, 10″ x 10″. I was driving around in Ste. Anne de Bellevue, looking for a good view to sketch with a little bit of distance in it, and remembered this spot where I can see frozen lake, barns and the highway in the distance. As the days warm up this week, I’ve noticed that the winter colours have softened. It’s funny how colours end up on the page when you are painting. I had no colour scheme in mind, and I didn’t set out to paint in pastels but that is just what the day is like and somehow that softness made its way to my paper. 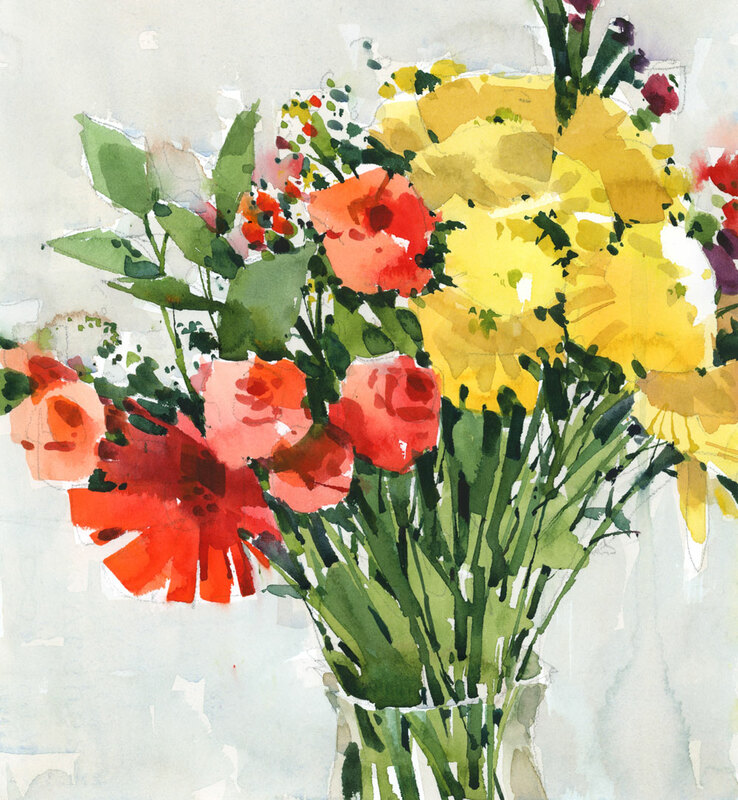 Painted on Arches Rough paper, 14″ x 10″. 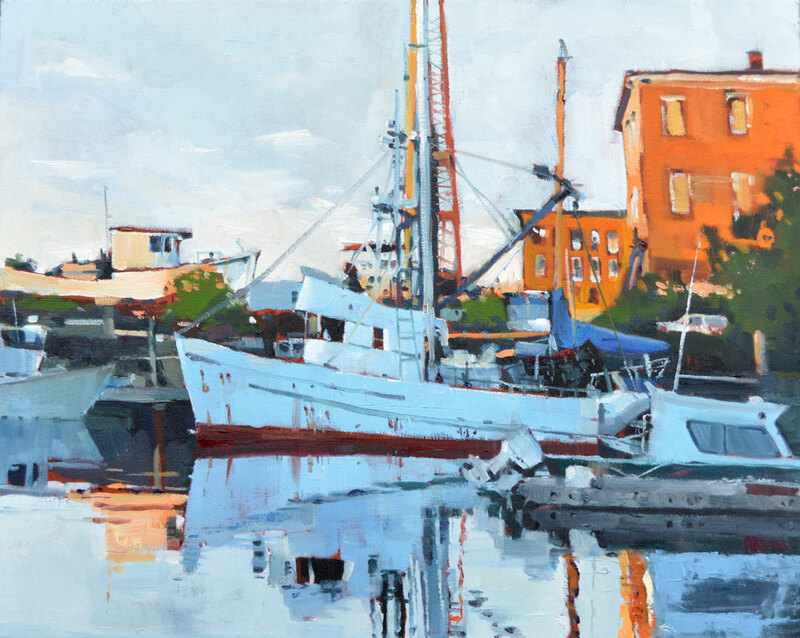 A few years ago I did a preparatory sketch for a bigger painting of a scene at Lovric’s boatyard in Anacortes, Washington. Reading my post about that sketch again today, I saw that I hoped to do a bigger painting soon. Well, it’s almost two years later, but nobody’s counting, right? Here’s the original sketch I did in watercolour, and what intrigued me then about the scene (the end of day light) was still what I was trying to capture this week. For this larger painting (16″ x 20″) I decided to try it in oils. It was a real learning experience for me, once again, with this new medium. Since this is only my third full oil painting, there are still many things that I am experimenting with for the first time. For example, the rigging and thinner lines are more difficult in oil. You have to wait for the layers underneath to dry before you add more lines on top. That is never something that I worry about in watercolour. Also, there were areas that I wasn’t happy with in the painting, so I scraped them out with a knife (first time for that too) and repainted them until I was satisfied with the colour. And then there’s the process of photographing the work! I tried a studio shot using the lights and technique I usually use for watercolours, but the shiny oil paint creates a lot of glare. After a few tries, I ended up going outside with the painting, putting it on my cold stone walkway and taking a photo of it in natural light. The colour is not quite right but at least the glare is gone. Next week: back to school which means more quick sketches and few paintings. Sigh. Here’s a painting I experimented with a bit, both in format and with paper stock. Last week I was driving towards Hudson on the road that runs along the lake. 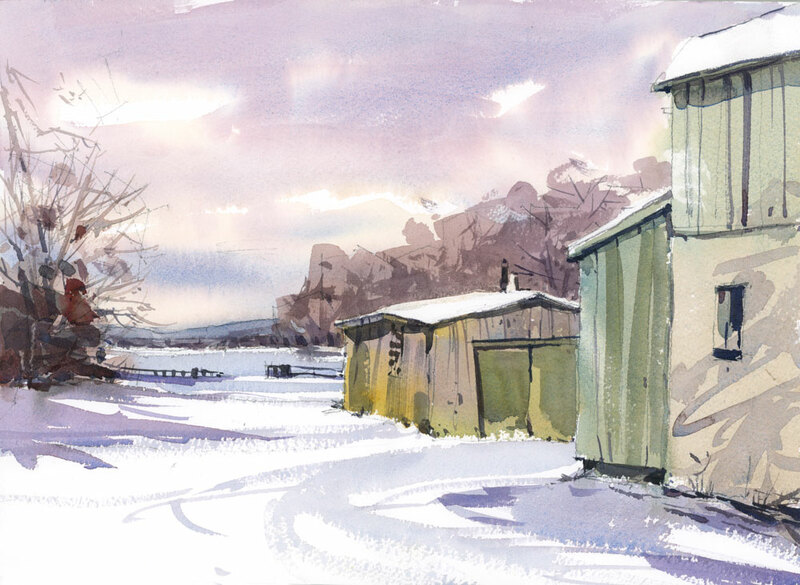 It was such a brutally cold day — made worse by the frigid squalls blowing across the field — that I couldn’t have painted in my car. In fact, it was almost too cold to step outside to take a reference photo, but I did it anyway. 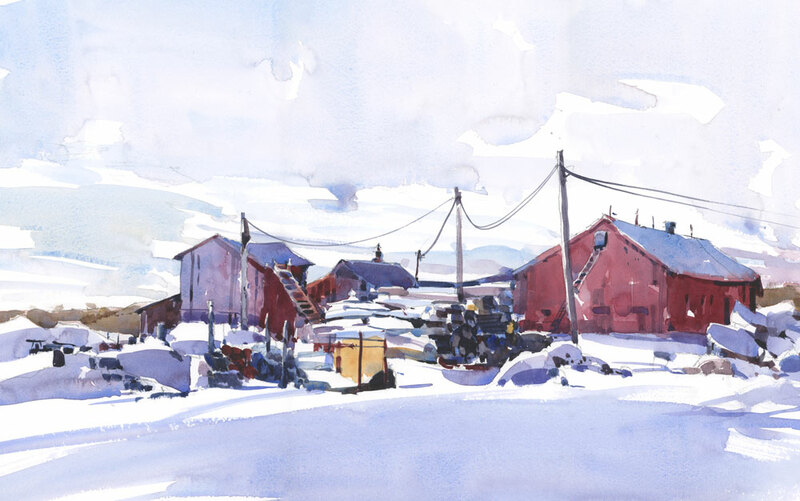 When I got back to my studio I thawed out my hands, and then I painted the scene on the remaining half sheet (15″ x 22″) of Schut Noblesse paper that I had. This is a paper that I find a bit too smooth (you can read out it here) but thought it might work for the snow shadows in this scene. When the painting was done, I found it a bit flat and decided to try it again. For the second try I used a full sheet (22″ x 30″) of Arches rough paper, which is not something I use very often, but I was hoping to get more texture and granulation than on the previous version. 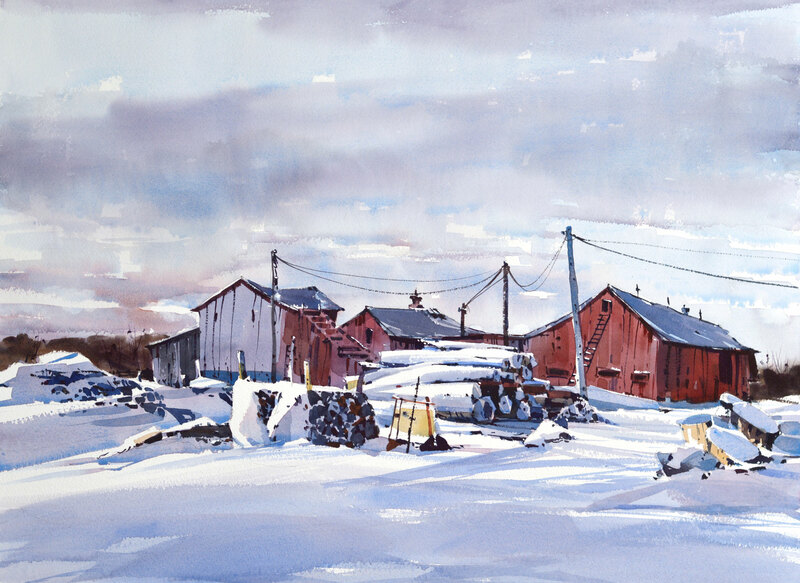 When the painting was done I stood back to have a look and realized just how much blue I had used, which I guess conveys well how cold I felt standing out on that road with the wind whipping around me as I looked at the scene.